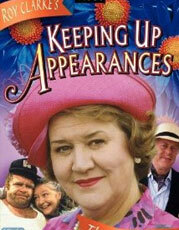 Hyacinth Bucket (pronounced Bouquet, if you please) lives to impress. And she has no patience for people who pretend to be superior -- because that makes it "so much harder for those of us who really are." Assured of her own eminence, she spends her days trying to make sure everyone else is, too. Her down-market sisters, Rose and Daisy, are a challenge, but she's always willing to talk about her rich sister Violet. Violet's eccentric, cross-dressing husband, not so much.